The Stainless Steel model with mesh band is now $150 off at Newegg and Amazon. The Huawei Watch is easily one of the best Android Wear watches on the market right now, especially when it comes to design. There are a few different styles to choose from, some costing more than others. 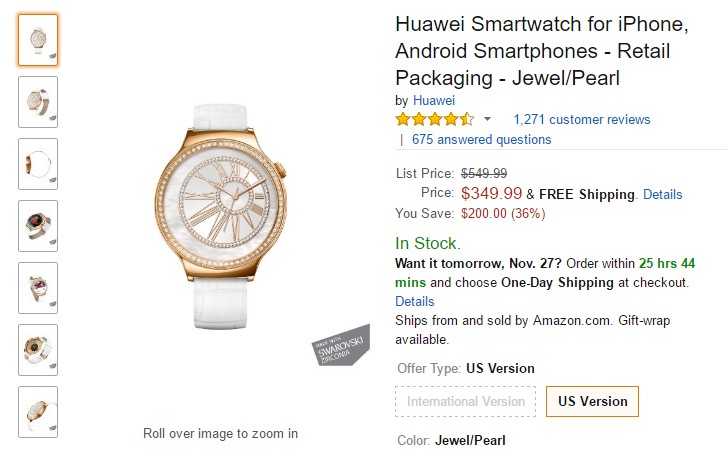 The Jewel/Pearl model, shown above with a gold finish and tiny jewels circling the display, is down to $349.99 on Amazon, B&H, and Walmart. That's a whopping $200 off the original price, by far the lowest it has ever been (the last lowest price was $470). If you're thinking to yourself, "What's the catch," there really isn't one. We gave the watch solid marks in our review, and with it being one of two watches with the Android Wear 2.0 preview, it's safe to say it will receive the finished update. If you think the Gold/Jewel design is too flashy, several other models are heavily discounted as well.